V Findlay Wolfe BLOG: Quilt sent. I'm looking forward to taking a few days to relax and snuggle my family, and to have family time, family games, and outings, and sleeping in! I am also looking at my 2017 scheduling, and am planning to travel slightly less in 2017-2018, as my daughter only has a couple years left at home. I want to be around to enjoy these last couple years, before college life starts. I'd also like to take more time in my studio! Traveling is great, I love teaching, and traveling, but I also want more studio time. I have so many ideas of projects I'd like to make that do not have deadlines attached to them! Much like when my double wedding ring quilt happened...I made those quilts purely for myself, because I had to make them; The exhibit and book came afterwards, as an after thought. That sort of creative time is so valuable to me. To must make, and be lost in the process. This holiday break, might normally look like a good time to get a bunch of work finished that is for deadlines, or quilt markets, but I am quite excited to just get to my house and play in my fabrics, and just make any old thing I want to, like a write just working in stream of consciousness. What will come from that play? What ideas will churn up? What new project can be dreamed up? Taking time for yourself to create, even for 15 Minutes, is worth it. FYI: Website shop orders placed after Christmas will not ship until January 4th. If you need anything, Please place your orders before the 24th. Stay tuned also, I'm working on some new templates for 2016... New fun quilting toys! Gosh ... this quilt is so-ooo pretty!!! Looking forward to seeing what you dream up from your play, too! Great idea to limit travel for a while. My daughter is now 29 and I miss spending time with her as she lives 3 hours away and is married. In October, we got together in Old Forge, NY for 4 days of just enjoying the ADK. What a treasure that was! You will never regret spending time with your daughter! I would love to spend more time sewing also, keep at it- you are innovative and do gorgeous work! 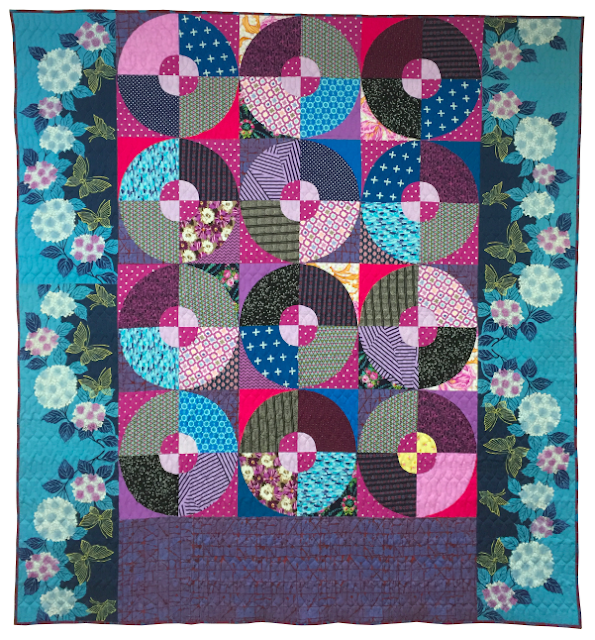 The quilt is a stunner and it is so you! Lovely! Merry Christmas to you and yours. Merry Christmas to you Victoria, I hope you enjoy some free creative time. Ha - quilt sent in the (St) Nick of time! God Jul! V - Have a wonderful break with your family. you've been working so hard!!! After all your teaching and travelling I reckon you do need a break - enjoy yourself and perhaps we shall be seeing a post in the New Year with the fruits of your quilting! Have a very Happy Christmas with family and fabric! Have a very Merry Christmas V and take it easy. It' been a fast, hard working, couple of years. Enjoy the time! Love the border fabric on this quilt. Amazing fabric choices for center. Have a Merry Christmas! The quilt looks fabulous, Victoria and I'm sure will be well loved. Have a fabulous Christmas time with your family......and with fabric play! Merry Christmas! Love the quilt. Wise words about the travelling, and also the need to make quilts because they NEED TO BE MADE to get them out of your head! I often look at quilters who make for books or classes, or blog sponsorship and really hope they are enjoying the process! Because I love quilting so much and it is part of who I am and helps with my sanity levels, I'd be really sad if the joy was taken away from me. I think you're very wise! It's good to strike that balance. And please, may I save a copy of this quilt to my computer strictly for my own inspiration?